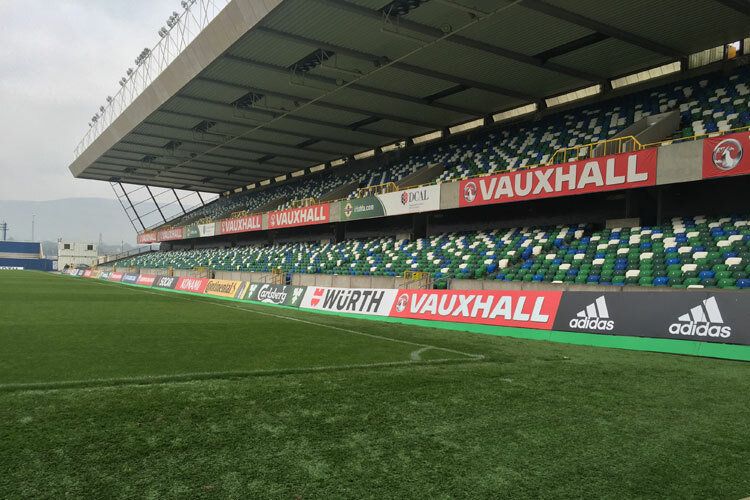 Signstik Limited have over 20 years experience supplying quality signage and display products throughout Northern Ireland from their purpose built facilities at Nutts Corner. 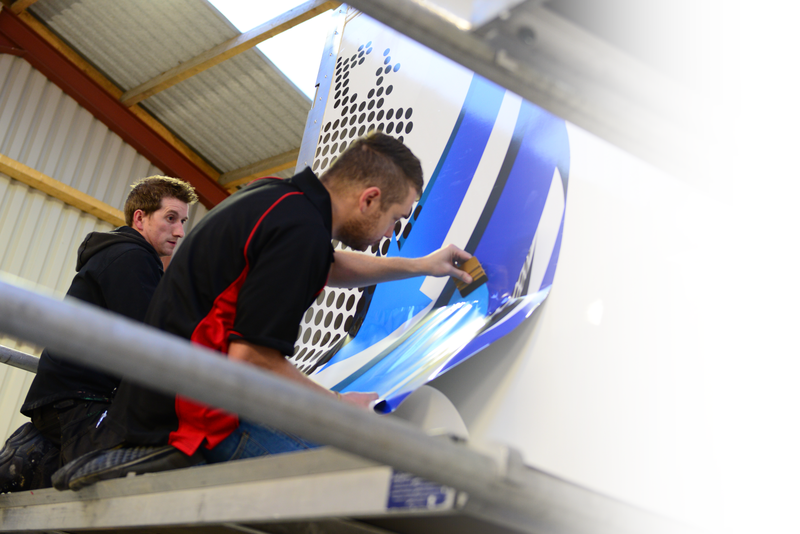 A commitment to use the latest in environmentally friendly processes and equipment in the design, production and supply of Full Colour Print, PVC Banners, Point of Sale, Window Graphics, Vehicle Graphics, Shop Signs and Display Products. An emphasis is placed on the provision of a bespoke quality service offering all clients an opportunity to promote their products and services in a professional and cost effective manner. Here at signstik we have built up the knowledge and expertese to offer our customers the best possible service at competetive prices. Having over 20 years experience has allowed us to build an excellent product list for our customers to choose from. We stock anything from snap frames, fixtures and fittings to roadside stands and bases. We have an extensive list of products to help meet our customers every needs. Anything we dont have, we will do our very best to get. This is because we truely value our customers and will do everything we can do facilitate them. Our 20+ years of success are testament to this and we hope to improve and grow in the future. Here at Signstik we can offer Diamond like precision. Our wide format printers offer you the latest breakthroughs in digital imaging technology. This allows us to provide our customers with anything from Stickers to large signage and vehicle graphics. Make a mark anywhere and grab the public's attention in an instant with our HD quality PVC banner printing service. Our PVC banners offer a high quality product at an affordable price. Manufactured from premium quality PVC with full colour printing, these vinyl banners have stitched hems with metal eyelets as standard.The durable material used to manufacture our products makes them ideal for use both indoors and outdoors. We can provide our customers with a range of Exhibition Display Solutions such as exhibition stands, pull up banners, lecterns, and portable display and exhibition equipment at a very competetive price. Personalise you business with our brand identity service. In a busy marketplace you want to stand out from the rest. We are here to help you with that. Contact us by phone , e mail or fax to make an enquiry and we will arrange to provide you with a free consultation ( either at your premises or at Signstik ) for your requirements and an initial quotation. We aim to work closely with clients to ensure good communication and regular updates throughout the project. We use the latest software to create designs tailored to your individual requirements and can sit down and go through any ideas or changes you wish to incorporate. To give you a better understanding of what your signage will achieve we can usually provide an image of your signage onto a digital photo of your premises. We can also offer a logo design and recreation service to help your business project a fully professional image. When the design of your signage has been finalised we will inform you of the expected production turnaround time and arrange an installation date if required. Signstik Limited have access to the latest manufacturing machinery and production techniques to ensure a reliable and durable product. We are constantly assessing the materials market to provide you with the most innovative and cost effective solutions. When the design of your signage has been finalised we will inform you of the expected production turnaround time and arrange an installation date if required. Signstik Ltd. have access to the latest manufacturing machinery and production techniques to ensure a reliable and durable product. We are constantly assessing the materials market to provide you with the most innovative and cost effective solutions. 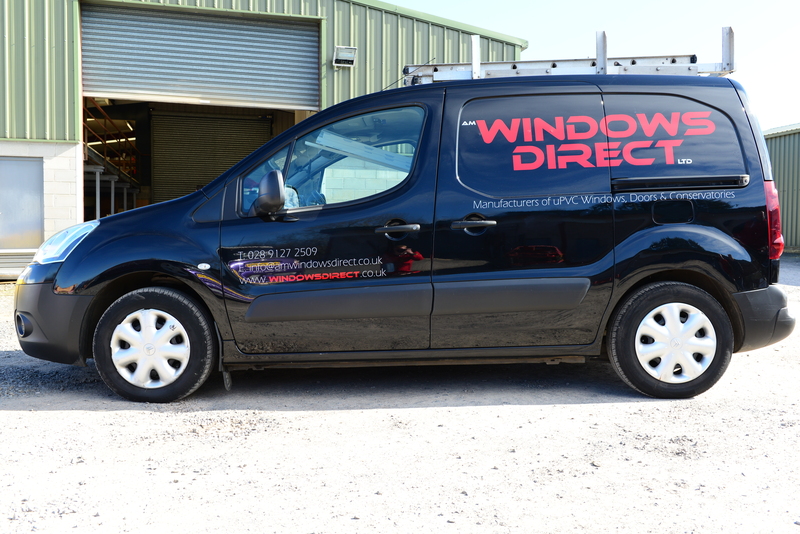 Our dedicated team of experienced installers will deliver your new signage to your premises if fitting is required. Prior to arrival they will liaise with your contact person to discuss any access requirements to ensure installations are carried out safely and at a time and date convenient to you. As an additional service the Signstik Team will be available to provide a Maintenance Service at your request to clean , inspect and replace any components required. From Northern Ireland, a land of stunning scenery and nature comes Groom Professional, a unique range of professional products. Groom Professional has been developed as a brand to combine a high level of quality, value for money pricing, innovative packaging and attention to detail which has not yet been seen in the animal grooming industry. At signstik, we provided Groom Professional with high quality vehicle graphics that are instantly recognisable anywhere. 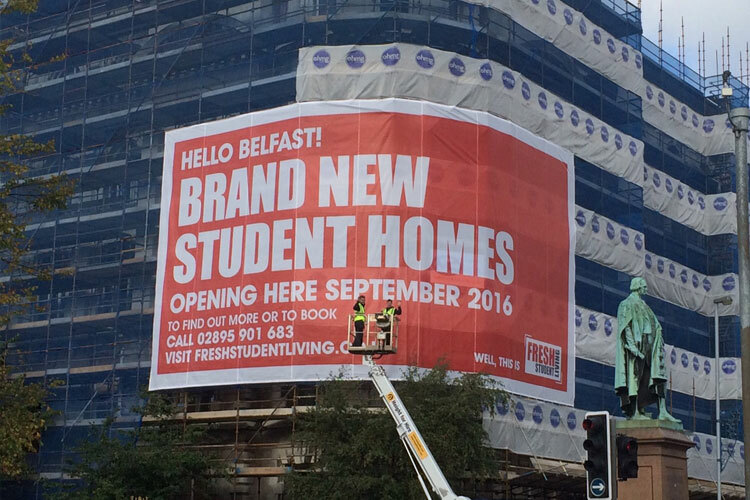 With Ulster University moving its Jordanstown campus to belfast city center there was a need for massive student accomodation and Fresh student living are provideing this in 2016. With a range of 6,000 modern, comfy and secure en suite rooms and studios in fantastic College and University locations across the UK Belfast is the perfect location for student accomodation with Ulster University and Queens University both in the city. In order to advertise the new accomodation building for future students we were asked to provide a large mesh banner that would cover the side of the building and make it obvious that there would be accomodation becoming available. Sometimes our customers just want something a little different and more interesting. 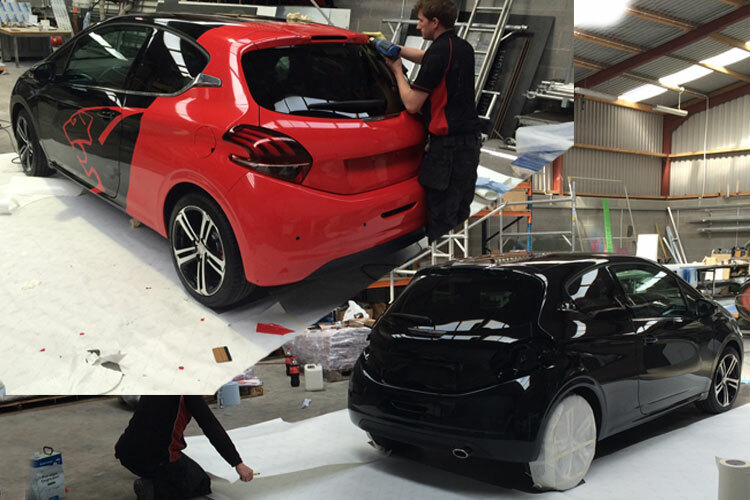 We wrapped this brand new peugeot 208 in gti peugeot graphics to a high standard. This is just an example of some of the work we do however it just shows the quality of work we carry out and how any vehicle can be used to advertise any business. This customer was looking for some graphics to make their new car stand out. With such a high quality logo this car has now ben given a more powerful look. 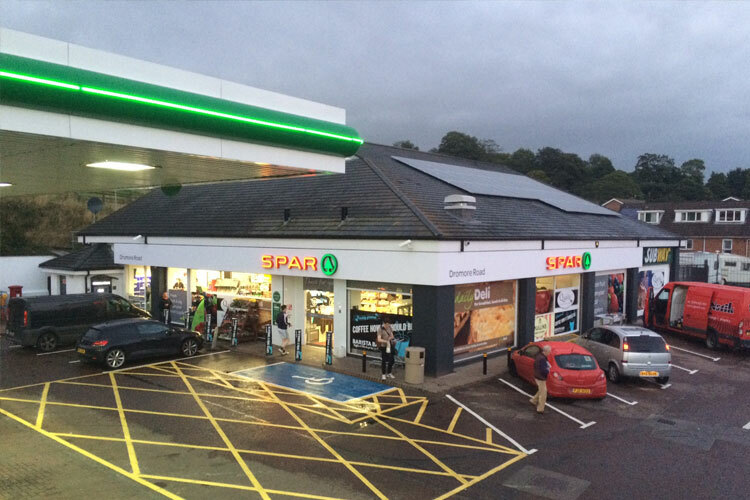 This new build spar store on the Dromore Road required completely fitted outside with a few bits and pieces inside. We successfully completed the outer signage and graphics all around the building in keping with the new spar branding. A clean and tidy job carried out to top standards in a short space of time. Along with their exterior signage, this spar store requested some interior signage to go along with it. We provided them with top quality products at an affordable price. Home-made ice cream is at the heart of Brennans. The business was originally founded in the 1930s by the Brennan family in Loughinisland. It is a well-established tradition for those in the know to call at Brennans during a Sunday afternoon drive and sit in their cars on the forecourt eating a poke! The ice cream is all vanilla flavoured, but is sold with a choice of toppings in which cones are rolled or tubs are topped, including marshmallows, crushed honeycomb, chopped nuts, chocolate chips and, of course, chocolate or raspberry sauce. 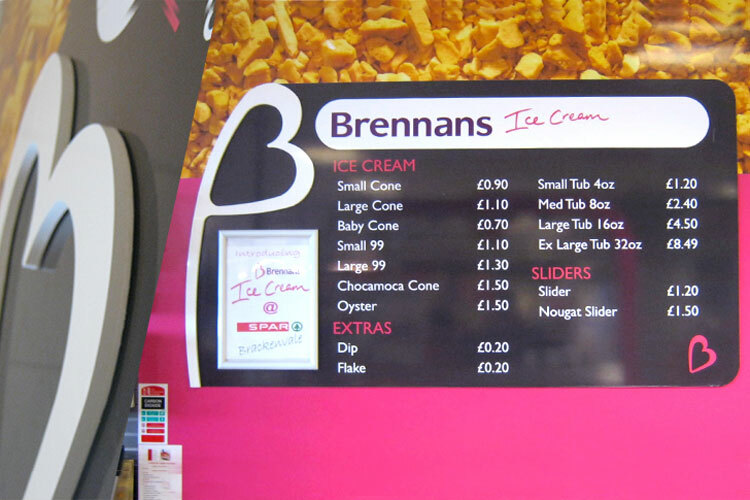 We provided brennans some interior menus and signage that was in keeping with their family business ideas. Clean, simple and effective. Sometimes our customers just want something a little different and more interesting. 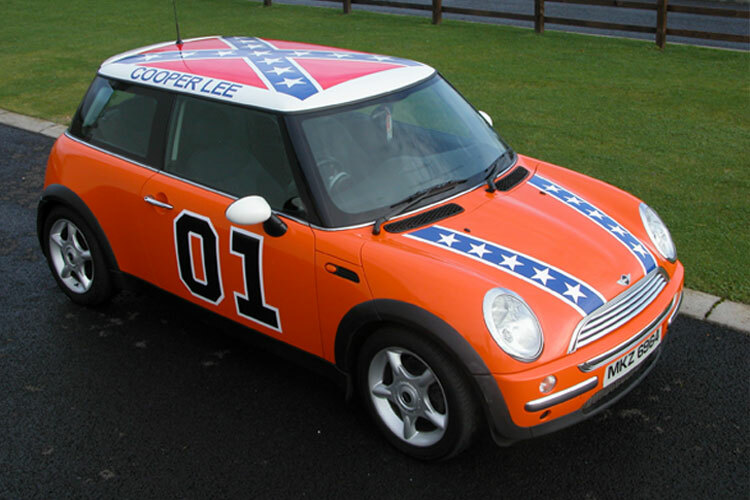 We wrapped this mini cooper in general lee graphics to a high standard. This is just an example of some of the work we do however it just shows the quality of work we carry out and how any vehicle can be used to advertise any business. So if its for the needs of your business or just for yourself, we can help! The Zip Yard was founded in 2005 after extensive market research identified a gap in the market where it found how very few body shapes conform to the ‘standard’ European sizes found on the High Street. With headquarters in Stockman’s Way, Belfast, The Zip Yard grew into a franchise with shops all over Ireland and entered the Mainland UK market place in early 2010. 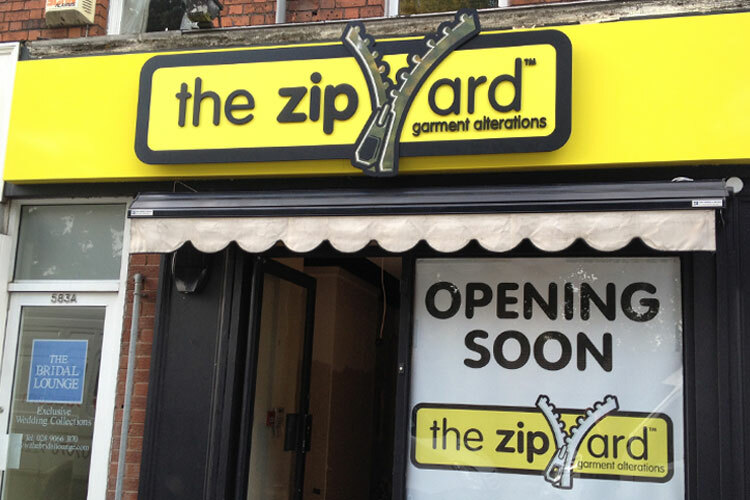 The success of The Zip Yard has relied on taking a different approach to the clothing alterations business. People want their garments, whether they are ‘every day’ items or ‘special occasion’ wear altered by trained professionals they can trust, quickly and efficiently, in clean modern premises. We took all of this on board when providing the zip market with their exterior signage for a local franchise. A. Hyde Farm Feeds is a family business, based beside the International Airport on the Crookedstone Rd. 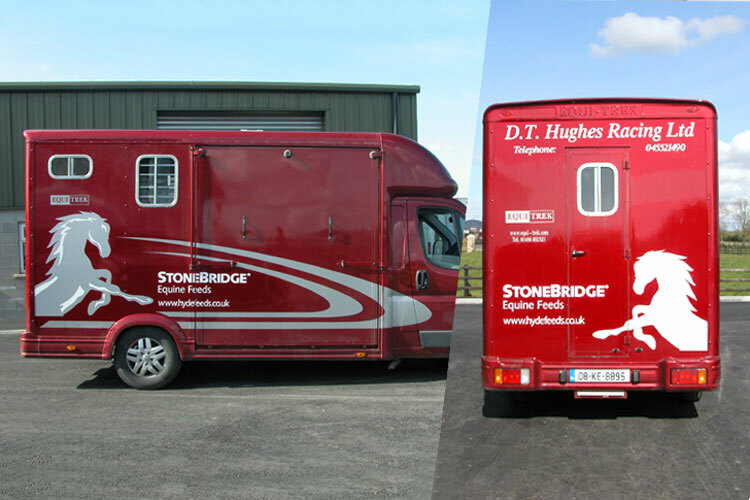 Stonebridge Premium Feeds originated from A. Hyde Farm Feeds, after requests from their customers to blend a feed for them which would bring out the best in their horse. After alot of research they developed their own range of unique equine feeds - home grown and home milled. Signstik provided A. Hyde Farm feeds with the graphics on their van that clearly show what they are all about. IFS Global Logistics is a group of Companies specialising in Supply Chain Services - Import and Export - both Internationally as well as to/from the UK and Ireland. IFS are experts in Freight Forwarding, Customs Clearance, Warehousing, and Last Mile Delivery. They operate ERTS and full type C Bonds and provide bonded storage solutions including full VMI (Vendor Managed Inventory). 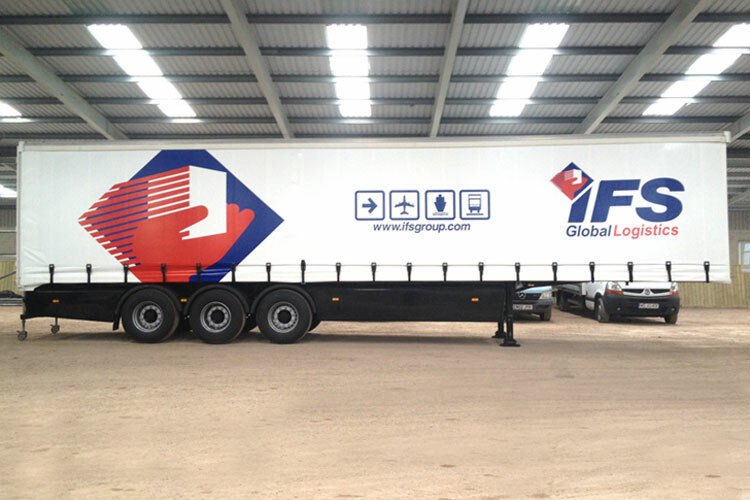 IFS Global Logistics empathize with their customers needs and when they came to us for graphics on their new trailer we took the same approach. Providing them with high quality curtain side graphics. 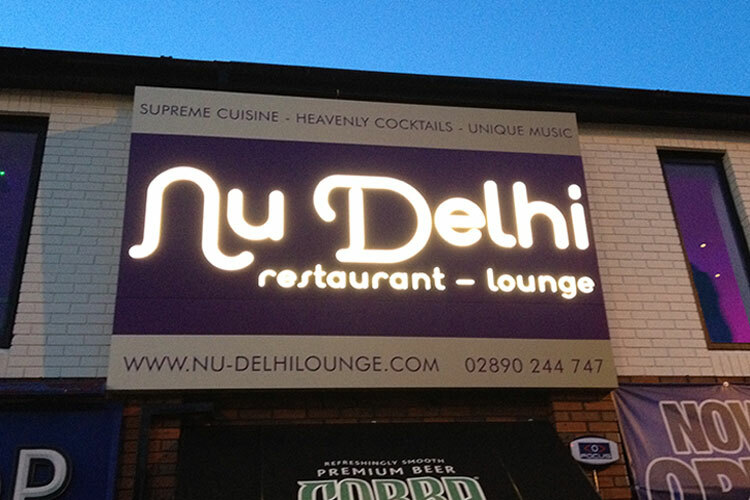 Nu Delhi Lounge, a high end 100 seater Indian restaurant welcomes you to a ‘Nu’ concept of eating out. Food, cocktails and music, all in one place and all delivered to perfection. They have combined this new concept to suit Nu Delhi’s cosmopolitan look – London has come to Belfast! And we provided them with exterior signage to suit. A large, bold, yet stylish display that can be lit up at night to attract customers to their restaurant. 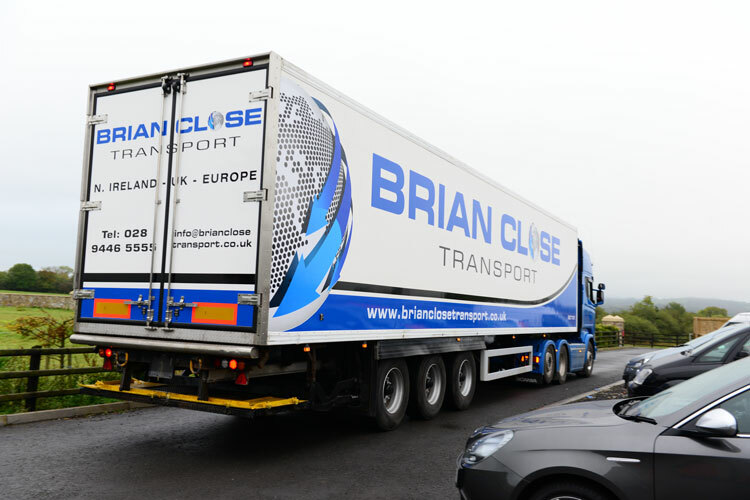 Brian Close Transport is an up and coming business offering transport services throughout the UK and Ireland as well as storage and logistics. With the rapid growth of their business we were asked to provide graphics for one of the new vehicles in the fleet so of course we provided. Such a large vehicle is always a challenge but we welcome a challenge at Signstik and we always deliver. Windsor Park is a football stadium in Belfast, Northern Ireland. It is the home ground of Linfield F.C. and the Northern Ireland national football team, and is also where the Irish Cup final is played. So there are alot of high profile games played here including Northern Irelands recent success in qualifying for the European Championships in 2016. We provide all the advertising pitchside for European and world cup games as well as in the dugouts and changing rooms. Always carried out to a high standard thanks to the tireless work of everyone at signstik, this is one of the most rewarding jobs we carry out. Copyright © 2015 Signstik Ltd.